Costia is a killer, a very fast killer. In most cases one does not even know that costia is even present until the fish is dead. There are usually but not always no signs of this parasite on the fish. The fish looks normal and healthy but is dead. Costia is hard to see on the microscope. 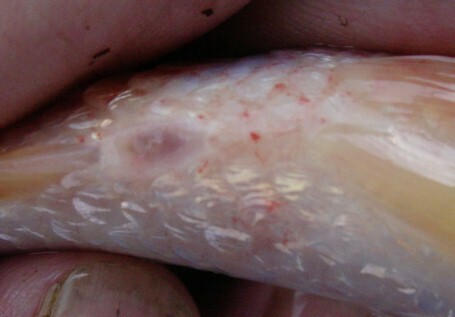 It is the smallest of all parasites that attack fish. Even for trained and experienced folks, it can still be missed. Costia is patchy, meaning it may be on one spot on the fish and no where else. So unless you scrape every inch of the fish which is not practical, you could still miss it. The problem with costia, once you find it, it is too late for the fish unless you discover it while the numbers of costia present are real low. Left unchecked you can expect more fish to die fairly fast. I have seen whole tanks/ponds wiped out in just a few days from costia. 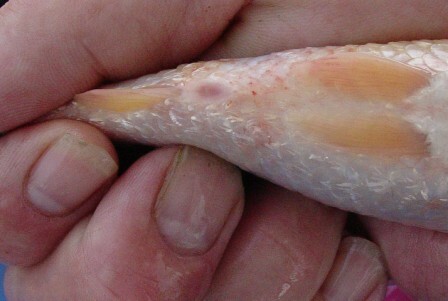 The above spider webbing, red veining seen in the pictures of the above fish are an indication of Costia. 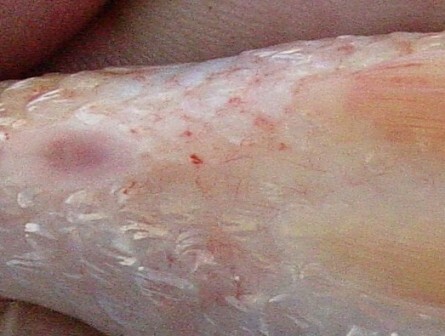 Keep in mind that you will also see these marks on fish that do not have Costia. Ammonia can cause the red veining. So can handling from shipping and stress in general. like trying to catch the fish, chasing it around the pond with a net. If you have checked the water parameters and the ammonia is 0 (remember none is acceptable), have not been chasing the fish excessively with a net, your best option is to think Costia.